Heat oven to 350°F. Grease bottom and sides of square pan, 9x9x2 inches. Mix sugar, shortening, vanilla and eggs in medium bowl. Stir in flour, cocoa, baking powder and salt. Spread batter in pan; sprinkle with pecans. Bake 20 to 25 minutes or until toothpick inserted in center comes out clean. Heat caramels and milk in 1-quart saucepan over low heat, stirring frequently, until caramels are melted. Drizzle over warm brownies. Cool completely. For 16 brownies, cut into 4 rows by 4 rows. If you like, save some time by substituting caramel topping for the caramels and milk. 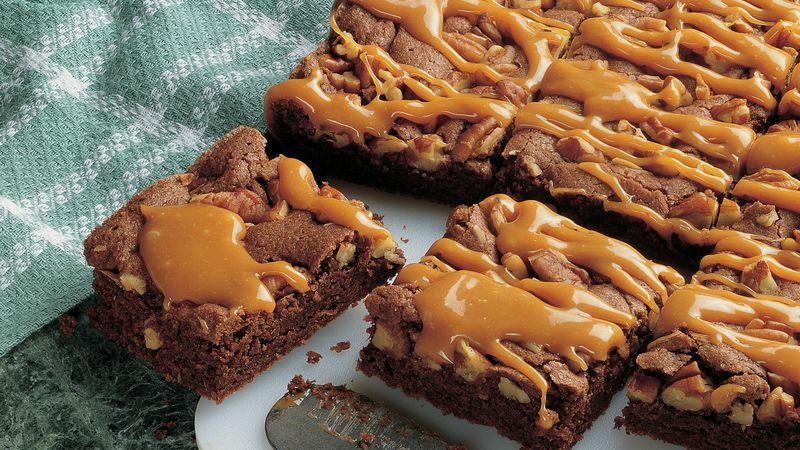 You'll enjoy the same great taste and have more time for eating brownies!